For farmers, growing quality crops is just one step in running a successful farm—making the farm or market garden economically viable and resilient requires another suite of skills, including finding land, planning what crops to grow, making a marketing plan, marketing the crops, managing income and expenses, addressing food safety, and hiring farm labor. The new edition of Teaching Direct Marketing and Small Farm Viability: Resources for Instructors, 2nd Edition, draws on nearly 50 years of experience teaching these skills to beginning organic farmers and gardeners at the UC Santa Cruz Farm & Garden Apprenticeship, offered annually by the Center for Agroecology & Sustainable Food System (CASFS). The 400-page manual, available free online or at cost in print, was written by a team of CASFS staff and invited experts. The new edition includes lectures, student exercises, and resources focusing on marketing strategies such as running a CSA project, selling at farmers’ markets, selling to restaurants, retail outlets and faith-based organizations, operating an agritourism venture, and using collaborative or cooperative options (e.g., food hubs and grower cooperatives). Also covered are strategies to reach customers using social media and on-farm events, and business strategies to improve small farm planning, including enterprise visioning and market assessment; creating a business plan, including marketing and crop plans; understanding basic bookkeeping and tax issues; and managing time and cash flow. New units in the second edition address food safety issues, along with labor considerations and apprenticeship options. Strategies for finding and leasing land, as well as an overview of alternative land tenure arrangements, are also addressed. The curriculum reviews the trends and factors that influence small-scale agriculture’s economics, and provides an overview of produce marketing in the U.S. The training manual is designed for a wide audience of those involved in teaching farming, marketing and sustainable agriculture, including instructors at college and universities, agriculture organizations, farm-training programs, and apprenticeship programs; agricultural extension personnel; farmers with interns; and growers, teachers, and organizers at urban farms, community gardens, and food projects with direct-marketing outlets. The manual can be used in a classroom setting or adapted for other training formats, such as short courses, conferences, and field days. Teaching Direct Marketing and Small-Farm Viability: Resources for Instructors is designed to be placed in a 2-inch, 3-ring binder so that sections can be easily removed and copied for class use. It is available from the Center for Agroecology & Sustainable Food Systems for $35 plus $5 for shipping in the U.S. (please inquire about international shipping costs). Price includes tax and handling; binder not included. All of the units are also available free online in pdf format and can be accessed at casfs.ucsc.edu/about/publications. See the Teaching Direct Marketing link. To order a print copy, send a check or money order made payable to UC Regents to: CASFS, 1156 High St., Santa Cruz, CA 95064, attn: Direct Marketing Manual. Please be sure to include your mailing address. If you have questions about the resource guide, or questions about ordering, please send email to casfs@ucsc.edu or call (831) 459-3240. Note that we cannot accept credit card payments. Generous support from the Gaia Fund, the True North Foundation, USDA Beginning Farmer and Rancher Development Program, Western Sustainable Agriculture Research and Education (WSARE), the Joseph and Vera Long Foundation, and the Eucalyptus Foundation funded the resource guide’s development. 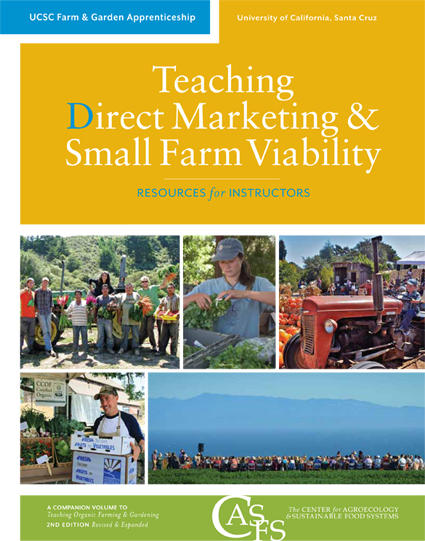 Teaching Direct Marketing and Small Farm Viability: Resources for Instructors, 2nd Edition, is a companion volume to Teaching Organic Farming and Gardening, Resources for Instructors, 3rd Edition, published in January 2015 by CASFS. For more information, see casfs.ucsc.edu/about/publications. Click on the Teaching Organic Farming link.